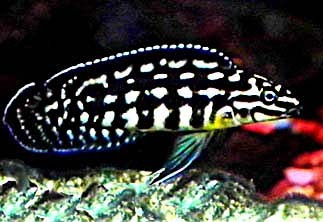 Tag Archive | "Marliers Julie"
The Marliers Julie (Julidochromis Marlieri) is a slender, torpedo shaped cichlid that is also referred to as the Checkered Julie, Marlieri Cichlid, Spotted Julie, and Plaid Julie by tropical fish keeping enthusiasts. 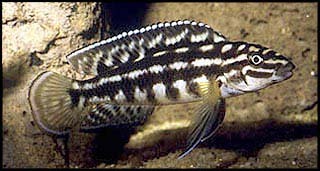 The Marlier’s Julie (Checkered Julie Julidochromis marlieri) is found in fairly deep water around the rocky shorelines of the northern, southern and western regions of Lake Tanganyika, Africa and is one of the more interesting species inhabiting the lake. They prefer living in deep water and inhabit the rocky recesses along the medium drop offs at depths between 16 to 100 feet. 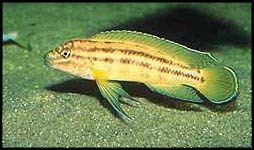 The various varieties of Marliers Julie are commonly named according their geographic distribution; for example Julidochromis marlieri “Mboko gold”, Julidochromis marlieri “Gombe”, and Julidochromis marlieri “Magara”. The Marliers Julie can be identified by the checkered type body pattern made by three or more horizontal rows of white spots, and the beautiful blue highlights which outline the entire body around the fins of the fish. 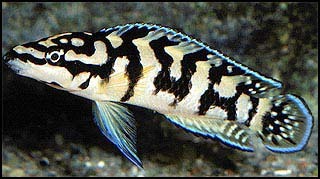 The color patterns of this species vary and depend on where in Lake Tanganyika the specimen was collected. Several slightly different color pattern varieties of Marliers Julie exist and all are extremely attractive. 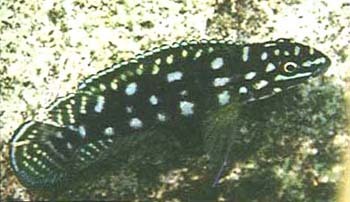 It’s close relative, the Masked Julie Julidochromis transcriptus is smaller and can be distinguished by having only two rows of white spots on their body. Some varieties have a uniform black and white colored body pattern, while others have more black, or more white in the pattern. Some specimens have what looks like white spots on a black background as their body color. Most species have all white bellies but a few species have irregular patches of white on their bellies. Some of the body patterns and color variations are listed below according to geographical areas of Lake Tanganyika where they are found. The Marliers Julie is an active, interesting, intelligent fish that has an intriguing personality and exhibits some quirky behavior. They will swim mostly in the bottom areas of the aquarium and will closely hug the rock surfaces, regardless of the angle and hold tight upside down inside the ceiling of their cave. 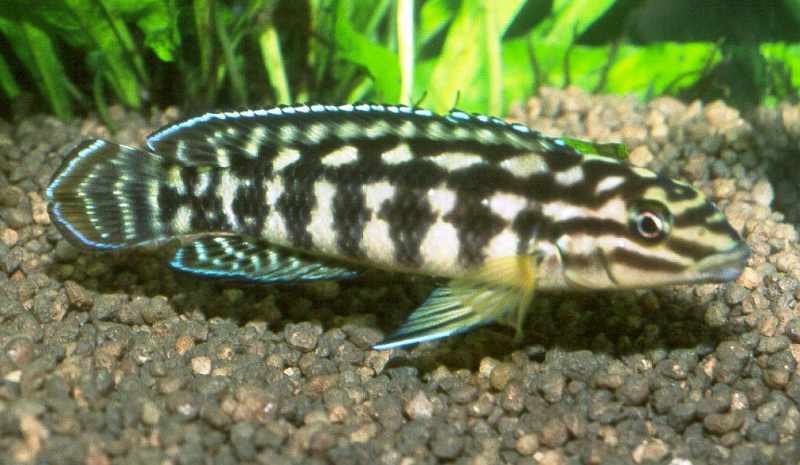 Although Marliers Jule are extremely territorial, they can be successfully housed with other similarly sized Tanganyikan cichlids like the Cyprichromis and Altolamprologus species however, unless you keep them in a huge tank, a breeding pair should be housed alone in a biotope setup. They do best in a large highly oxygenated tank with a sandy or very fine grain gravel substrate and plenty of rock piles arranged to form caves and caverns. Hardy plants can be added to the tank without concern, but if you are keeping more than one species of rock dweller in the tank, make sure you provide them with distinct piles of rocks to minimize aggression. 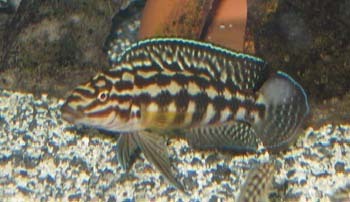 Adult Marliers Julie are belligerent towards one another, especially when a large water change is made in the aquarium. This will almost certainly cause a mated pair to turn on each other. Weekly partial water changes should keep the fish healthy and in good condition. The Marliers Julie is easy to breed but patience is needed. Females are have a longer genital papillae that is flatter on the end while the male’s genital papillae is shorter, more pointed, and angled toward the back. Male Marliers Julies are smaller and have a lump like swelling on their neck. The easiest way to obtain a breeding pair is by purchasing a group of young fish and allowing them to pair off naturally. This may take up to a year or more, but once a pair develops, they will remain mated for life. When the pair is identified, remove the other fish from the tank and make sure the water parameters of the breeding tank are: medium hard water with a pH of around 8.2-9.0, 12° dGH, and a temperature between 75 – 78.8° F.
When ready to spawn, the female will lay 50 – 100 bluish green colored 1.2 mm eggs in a cave of her choosing, usually on the walls or on the celiing of the cave. After the eggs are laid the female will guard the eggs, while the male guards the cave. The parents are dedicated to their young and after the eggs hatch, will take turns guarding the fry. The parents normally allow the fry to stay in the area until they are about 1″ long, even when new batches are hatched since they will help guard their siblings. 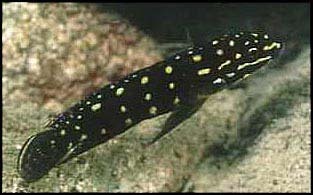 Marliers Julies will spawn every 5 to 7 weeks so make sure there are a lot of rocky crevices for the young to hide among. Avoid keeping plecos in the tank because they will eat the young if given the chance, especially during the night. Some breeders siphon out a majority of fry when they are born into a 20 gallon tank to maximize the survival rate of the young. The young are slow growers but can be fed baby brine shrimp as soon as their eggs sacs are absorbed. When doing this, leave a few young in the breeding tank for the parents to rear. The brood care is quite long and the young can stay with the parents until they reach 1″ in length. At this size the adults can turn on their young. Often the adults will spawn again while the initial brood is still in the aquarium. This forms a “nuclear family” with the older fry staying in the territory of the parents and tending to the new brood of eggs. brine shrimp . Some vegetable matter like blanched spinach or spirulina will also be eagerly accepted. Its best to feed them several small pinches of food daily, instead of a larger quantity single feeding. This helps maintain water quality and mimics their natural grazing behavior. 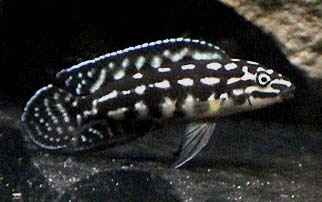 The Marlier’s Julie can be found online and in specialty tropical fish shops. Depending on the size and variety, they can be moderately, to very expensive and when available for purchase can be juveniles of 1 1/2″ in length, to adults at 5″ to 6″ in length. Because hybridization of this species is relatively common, be sure to purchase from a reputable dealer.